Ideas…Where Do They Come From? I think most authors will tell you that one of the most frequently asked questions they get is: Where do your ideas come from? The answer may vary slightly from author to author, but most writers I know will tell you their ideas come from everywhere! A spark of a plot may come from an overheard snippet of conversation or a television show. Inspiration may strike when reading a magazine, listening to the radio or viewing a movie. A brilliant concept could appear in a dream or the muse may smack you in the face with your latest book idea from out of nowhere. Now you may be saying to yourself, everyone watches television, reads magazines and has interesting dreams. And that’s true. But what makes the writer different from everyone else is that they delve deeper and start asking questions. I like to call them the “what if” questions. What would a character do if she found herself in certain situation? What happens next? Authors will also take seemingly unrelated ideas and connect them. That’s what happened to me with my latest Samhain Publishing release—Night of the Tiger. I was on one of my Yahoo groups a few years back and someone had posted one of those blog quizzes. You know the ones. You click a few buttons to answer some questions and they tell you which color most represents you, which cookie you are like, or which zoo animal you might be (if you were indeed an animal). On this particular day, the quiz was about carnival rides. I filled out the questionnaire and discovered if I was a carnival ride I would be a carousel. No surprise there. I’m not one for roller coasters or other death-defying rides. A slow, gentle carousel suits me just fine. But I kept thinking about the carousel and wondered what one might look like if the animals were more exotic, maybe even mythical, rather than your run-of-the-mill horses. Then I started asking the “what if” questions. What if the animals on the rides were really trapped there by an ancient curse. What if they were really immortal shapeshifting warriors. Why were they there? How would they escape? What dangers would surround them? Throw in an ancient feud between a god and goddess and I had the seeds for not just one book, but a new series. These thoughts wouldn’t leave me alone and I outlined a four-book series I entitled Hades’ Carnival. 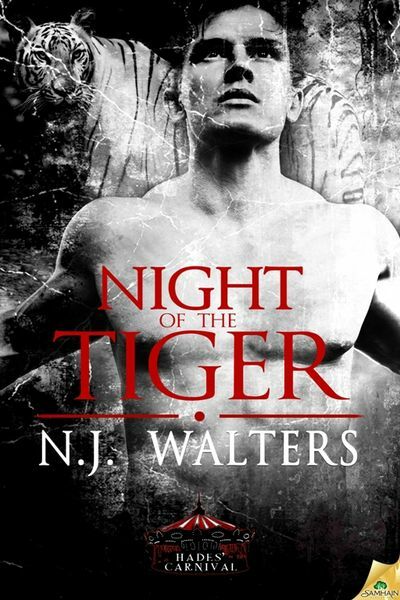 Night of the Tiger is the first book and introduces you to Roric, immortal warrior and tiger, and the very mortal woman who helps break his curse. To win the battle for his soul, he may have to sacrifice the woman who set him free. Aimee Horner lives and breathes her career as a graphic novel illustrator, but she never expected it would invade her dreams. In recent months, worsening nightmares have pulled her into the darkest corners of Hell. On a rare night out with friends at a traveling carnival, she finds herself strangely drawn to an abandoned carousel adorned with vividly exotic animals. One steed, a massive white tiger, is a temptation she can’t resist. The moment she climbs upon him, her world changes forever. More than five thousand years ago, Roric and his fellow shapeshifting warriors were imprisoned in their animal forms, a last-ditch effort by the goddess they served to save them from the horrors of Hell. With one special woman’s touch, he has a chance at freedom and redemption—but the clock is ticking. If he is still alive in twenty-four hours, the spell will be broken, and Hell will have no claim on his soul. The only hitch is his blazing attraction to Aimee. If only he could trust that she isn’t merely a distraction sent by Hades—luscious bait to lure him from his mission. So you see, writers find their inspiration everywhere, which is why there are a never-ending supply of stories to tell. So when they tell you the ideas for their books come from everywhere, they’re telling you the absolute truth.